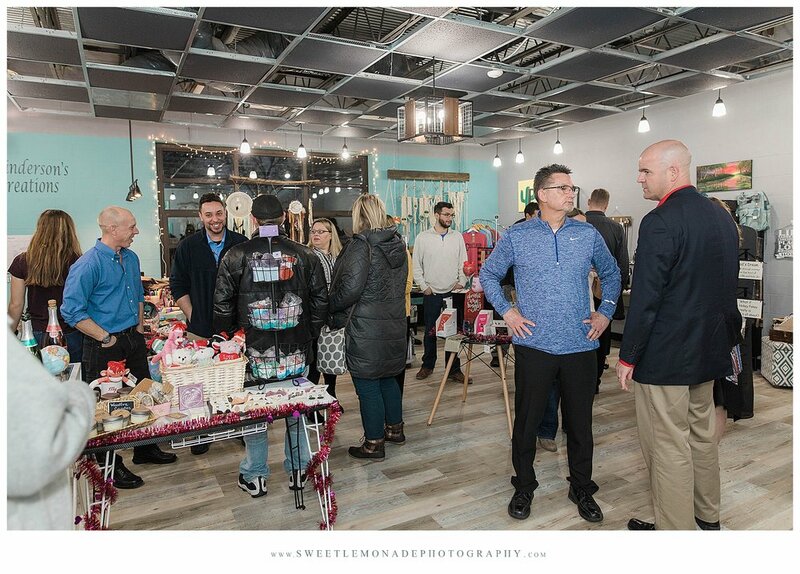 Mahomet Citizen ran an article on Winderson’s Creations last summer (you can read it here) and since then their business has grown by leaps and bounds. Mary Pettenger, after years of juggling a full-time job and running Winderson’s in her free time with her cousin, last fall provided the perfect storm and in her heart she felt it was ‘now or never’ to take the plunge and run Winderson’s full time. After a conversation with her husband Eric, who fully supported the decision and encouraged her to chase her dreams, she signed a lease for a space at Sangamon on Main, the former Sangamon grade school. And that’s when the real work began. In less than 30 days, they transformed a classroom to their retail shop. New flooring, walls, painting, lighting, etc. It was quite an undertaking but one they accomplished by their self imposed deadline to open up before Christmas giving people in the community another option for purchasing their holiday gifts and stocking stuffers. Pictured below is Mary’s family present for the ribbon cutting. Mary had told me this business would not have been possible without the support, encouragement and involvement of her loved ones. In addition to all of that, I also know how proud they are of her… evident by the note on the flowers her daughter had delivered for the ribbon cutting ceremony. Last night, Mahomet Area Chamber of Commerce hosted Winderson’s ribbon cutting ceremony. I’ve been in their shop several times since they’ve opened and each time there are so many new products that it feels like a new shop each time. Winderson’s carries items for men, women and children. Gifts, clothes, decor and accessories fill their shop. I love that some of the items available are made by kids. Mary’s daughter Mya makes a variety of items including slime (which was a big hit with my boys at Christmas). And Winderson’s carries handmade soaps and bath bombs made by another young girl (my neighbor actually) who operates a business called Lavender and Lilly. They are the bomb dot com! One of the many options Lilly offers is a duck soap, which you can see a photo of below. I love that Mary has provided these young entrepreneurs with opportunities to sell their products (that are legit good and worth purchasing) a platform to learn about the business side of things. It will serve them well in life! Mary provides opportunities for adults too. Angel Yancy, an MS graduate and long time resident has her artwork/paintings in the shop for sale as well. And if you’d prefer to MAKE art instead of just buy it, Winderson’s Creations hosts creative classes for you to do your own thing. Keep up to date on what’s coming up by following them on Facebook (link below). Their shop is also a place to hold events/parties so contact them if you’re looking for a unique space for a gathering. Here’s something Mary shared with me that I think is incredibly awesome. “Due to my background in behavioral/mental health I offer smaller events for those with sensory issues and offer events for all levels of ability. I am currently working with a local Mental Health/Developmental Center to provide events their clients are able to participate in,” Mary said. It was fun to see so many people come out to the ribbon cutting ceremony to support Winderson’s. If you haven’t done so, do yourself a favor and go check them out! Follow Winderson’s on Facebook. Hint, if you like deals you will definitely want to follow them! Have you heard about the new doggy day care in Mahomet? Check Ruff Dayz out! Do you have a high school who loves to be in front of the camera? Then you need to check this out! Are you a local business that could use photos? From headshots to products to branding sessions, contact me and let’s chat about how I can help you.